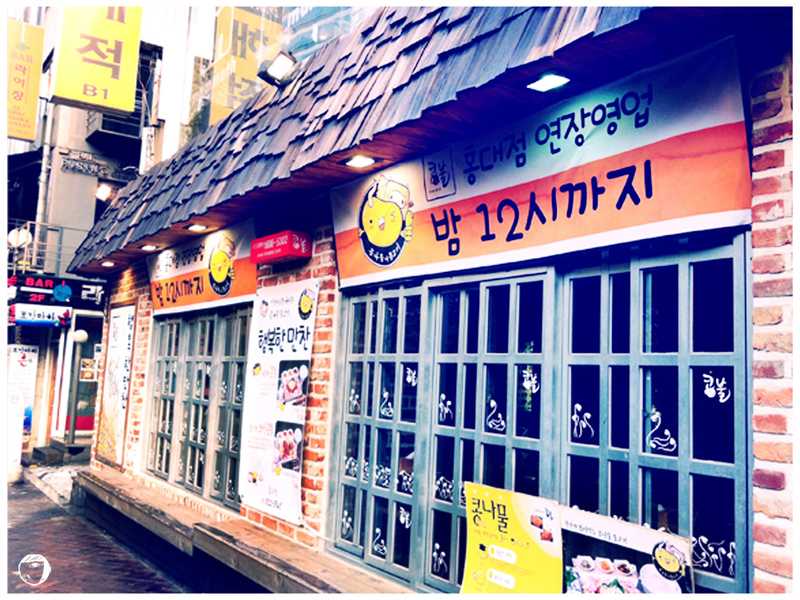 My first time dining at Kongbul 콩불 was at Hongdae outlet with my mom and my brother. After walking around Idea almost the whole afternoon, we were starving. 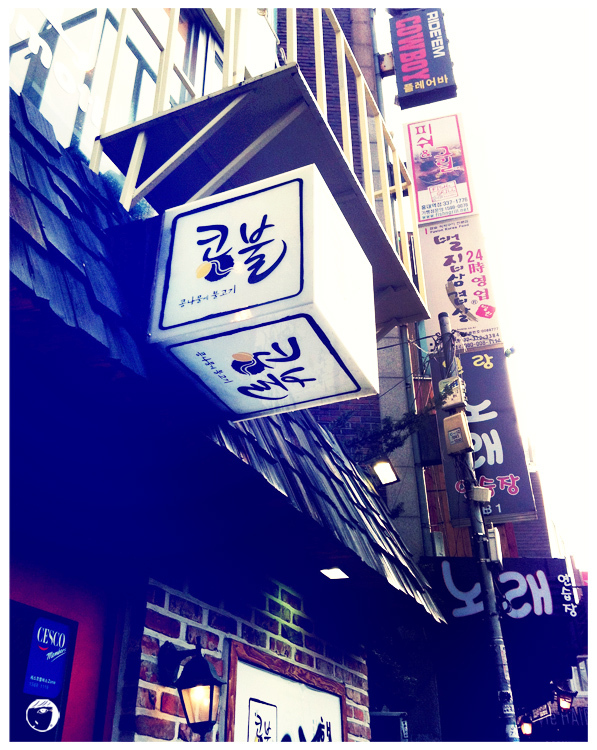 Since our next destination was Hongdae, we decided to have our late lunch there. 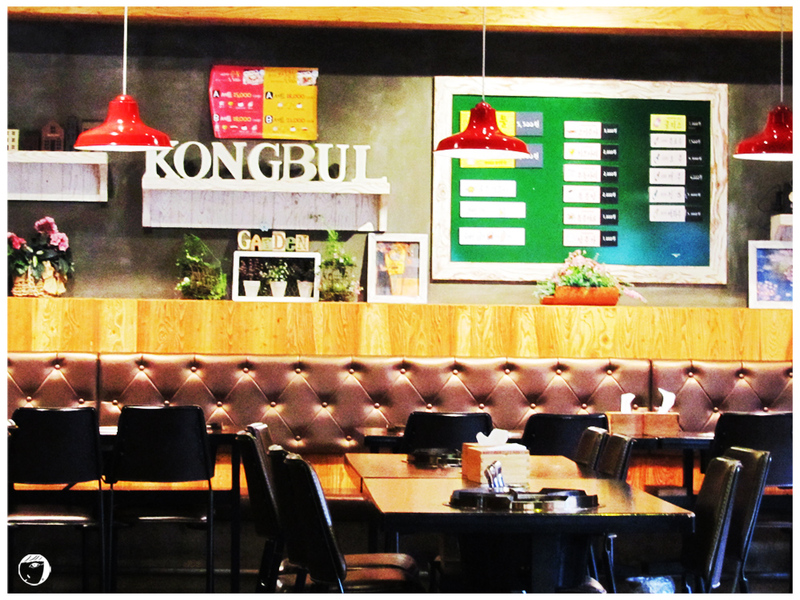 Kongbul 콩불 is franchise restaurant and has many other outlets across Seoul. Initially I had no idea about what food they serve here. But the menu pictures outside attracted me. 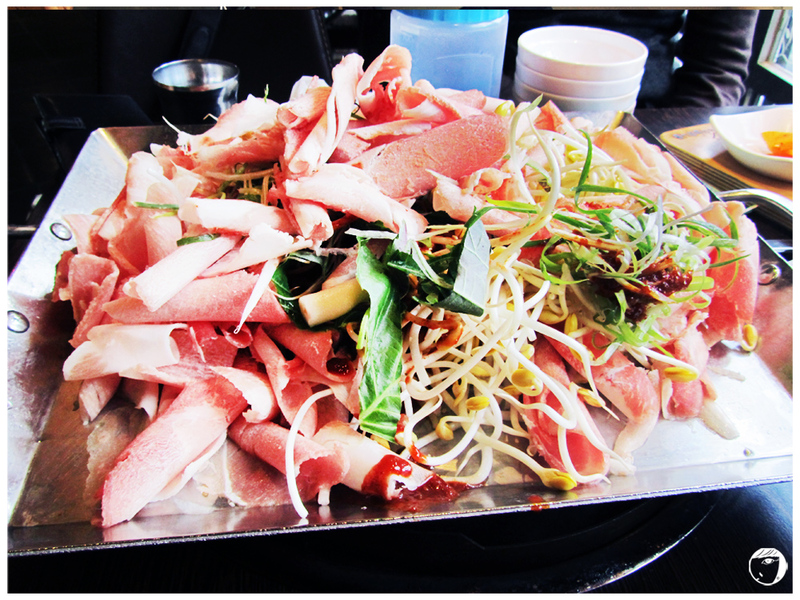 The idea of a huge platter of meat and lots of veggies sizzled together on a pan was so tempting. We walked into the restaurant. Since it was not a lunch nor dinner hour, there were only 2 other guests besides us. After choosing our seats, I went to the counter to order. From the menu, they basically served only one type of dish with different choices of toppings. 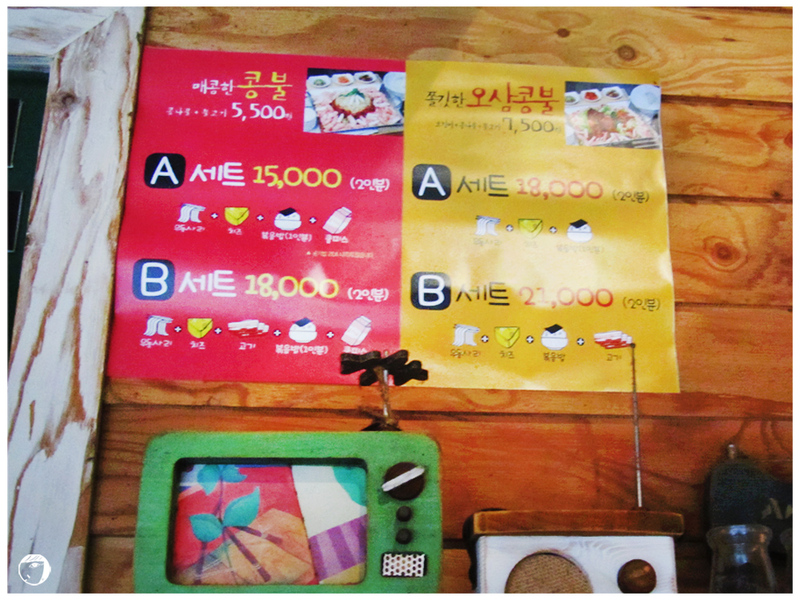 From the menu here, there are 2 types; with / without squid (ojingo 오징어). There are sets for 2 with options of toppings of noodle, cheese, fried rice and bacon and drink. We ordered for Kongbul Set A (without squid and bacon). And because there are 3 of us, we have to add extra a la carte for one person. 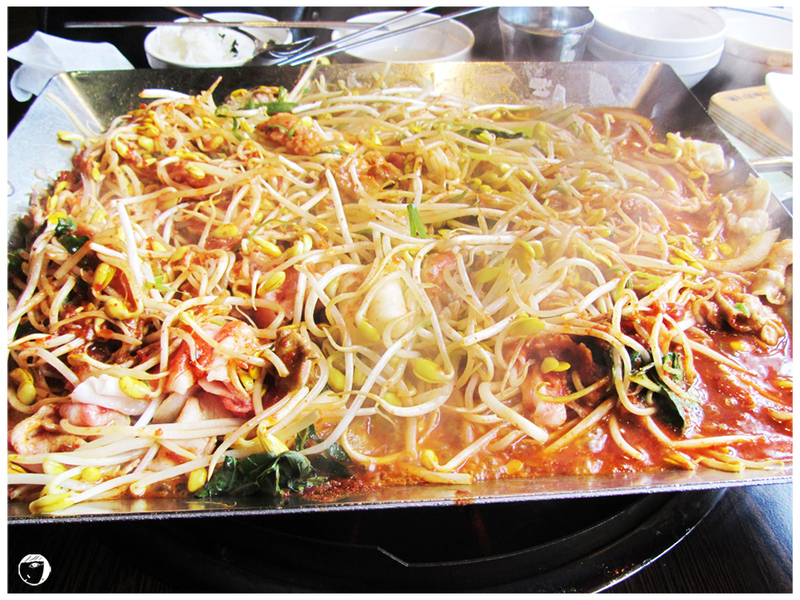 They brought out a huge pan of uncooked food onto our table, which had an integrated stove. Now we have to wait till the meat and the veggie was cooked. Despite of having the integrated stove on out table, the staff would do the cooking for us. After 10-15 minutes, finally the food were cooked! It was so good! I’m personally a fan of bean sprouts. Although it may be a simple meal only with pork meat and bean sprouts, it is cooked in a teppanyaki-style. Just slightly before the meat and veggie was cooked, the udon noodles went in. For those who can’t eat spicy, unfortunately this is not a good option for you. This delicious dish is spicy. Even for me, who love spicy food, admit that this is spicy. The drink that came with the set was our saviour for the meal. It could really cool down out the hot taste of red chilli paste gochujang 고추장. Last but not least, when we were already almost full, the staff went back to our table and throw in the rice with more red chilli paste gochujang 고추장. If you eat enough of Korean dish you will encounter that some dish mix rice only towards the end of the meal. This is what they called fried rice or 볶음밥. Take subway to Hongik University station 홍대 (line 2, green line) and take exit #9. Turn left to the street and keep walking towards the Aritaum cosmetic shop. Before you reach the Aritaum, turn right and walk along the restaurant streets. The restaurant is on the left hand side, located just a few shops before Gong Cha bubble tea shop.